The BRZ/GT86 collaboration between Toyota and Subaru has been knocking around for a few years now. When it was initially released the car was received well by critics, a relatively affordable sports car that harked back to a simpler time – when enjoyability was more important than top speed. One criticism some people had of the GT86/BRZ was that the car was slightly underpowered, however to date neither Toyota nor Subaru has released a performance boosted production ready version of the 86. 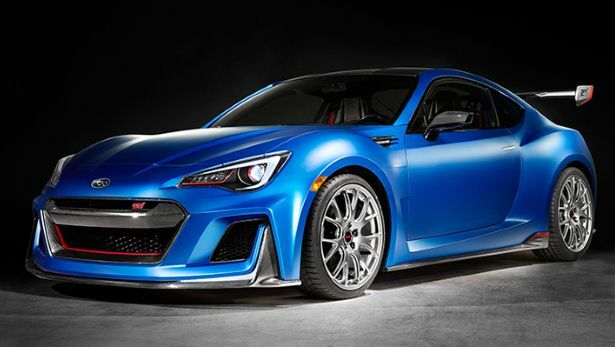 At this year’s New York Auto show it seemed Subaru had addressed this issue with an STI version of the BRZ, though as it turns out it’s only a one-off concept. Subaru announced that this ‘STI Performance Concept’ is simply marketing tool to better acquaint the US market with the brand. The performance injected BRZ is noticeably different. It has been treated to lower, stiffer STI-spec suspension, new 18-inch alloy wheels, custom Brembo discs and pads, a monster rear wing, a full new body kit (new front and rear bumpers, carbon fibre mirrors and side skirts), chassis improvements- to better control body roll – a flexible tower strut bar designed by STI, and a beefed up engine. For this concept Subaru has done away with the BRZ’s factory 2.0-litre boxer engine and replaced it with the EJ20 2.0-litre single-scroll turbo boxer from its GT300 race car. Subaru officially quotes power at 345bhp and 332lb ft. of torque, but Subaru’s Dominick Infante says the concept actually produces closer to 450bhp. “They quote it lower on the stand, but that’s just an agreement between the Japanese manufacturers,” he smiles. On the interior front, custom gauges have been added, as well as Recaro seats, an Alcantara steering wheel, a new centre console and on the exterior a custom matt blue paint job has been added. Come on Subaru, make this a reality…. we’d even settle for factory turbocharged version of the standard 2.0-Litre! A complete tease. The BRZ/GT86 is a great looking and driving car, sadly limited by lack of forced induction (and therefore rapid tuning potential), and when a hot clio has more horsepower they really need to up their game. It's a drivers car no doubt, but horsepower inflation has left it lagging and even though you would have immense fun at a track day in one, being overtaken by all and sundry on the straights would grate on you. Its definitely bucking the trend by not having oodles of horsepower and a brave move in this day and age. But it is a moot point whether bhp is the real be all and end all of driving. I mean, I'd still rate the Peugeot 205 GTi as one of the most fun cars I ever had and in factory fresh 1.6 form, it had 115 bhp. And I'm sure some of my horses had long escaped. Could do with about 25-30bhp more to be honest, some more torque. That said, for real-world, on-the-road driving, the BRZ / GT86 is fine. It isn't going to break any land-speed records, but hopefully I will hold on to my licence, points-free for a good while yet. It is a great car to be driving...had a great blast over Craigantlet the other day. The more power you have, the greater the temptation to use it ... more than likely, at all the wrong times!